NOTICE: Activation key must be used on a valid Steam account. Requires an internet connection. 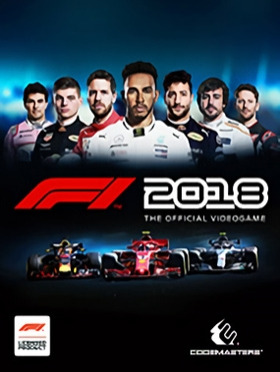 About the game	MAKE HEADLINES in F1® 2018.F1® 2018 is the official videogame of the 2018 FIA FORMULA ONE WORLD CHAMPIONSHIP™. Become immersed in the world of Formula 1® more than ever before when F1 2018 releases worldwide on Friday 24th August 2018.Build your reputation both on and off the track, … with time-pressured media interviews that influence your F1 career path. Do you exhibit sportsmanship or showmanship? Will you develop your team to the top or send your agent to target a rival team and driver? F1 2018 puts you in control of your destiny. Key features More classic F1 cars than ever before The most accurate F1 car simulation model yet Stunning graphics and new circuits for 2018: Paul Ricard and Hockenheim system requirements Windows - Minimum Requires a 64-bit processor and operating system OS: 64bit Versions of Windows 7, Windows 8, Windows 10 Processor: Intel Core i3 2130 or AMD FX 4300 Memory: 8 GB RAM Graphics: Nvidia GT 640 or AMD HD 7750 DirectX: Version 11 Network: Broadband Internet connection Storage: 50 GB available space Sound Card: DirectX Compatible Soundcard Additional Notes: Requires a 64-bit processor and operating systemWindows - Recommended Requires a 64-bit processor and operating system OS: 64bit Versions of Windows 7, Windows 8, Windows 10 Processor: Intel Core i5 8600K or AMD Ryzen 5 2600X Memory: 8 GB RAM Graphics: Nvidia GTX 1060 or AMD RX 580 DirectX: Version 11 Network: Broadband Internet connection Storage: 50 GB available space Sound Card: DirectX Compatible Soundcard Additional Notes: Requires a 64-bit processor and operating system	F1 2018 Game - an official product of the FIA FORMULA ONE WORLD CHAMPIONSHIP. © 2018 The Codemasters Software Company Limited (Codemasters). All rights reserved. Codemasters”®, “EGO”® and the Codemasters logo are registered trade marks owned by Codemasters.The F1 FORMULA 1 logo, F1 logo, FORMULA 1, FORMULA ONE, F1, FIA FORMULA ONE WORLD CHAMPIONSHIP, GRAND PRIX and related marks are trade marks of Formula One Licensing BV, a Formula 1 company. © 2018 Cover images Formula One World Championship Limited, a Formula 1 company. Licensed by Formula One World Championship Limited. The FIA and FIA AfRS logos are trade marks of Federation Internationale de l’Automobile. All rights reserved.All other copyrights or trade marks are the property of their respective owners and are being used under license. Developed and published by Codemasters.